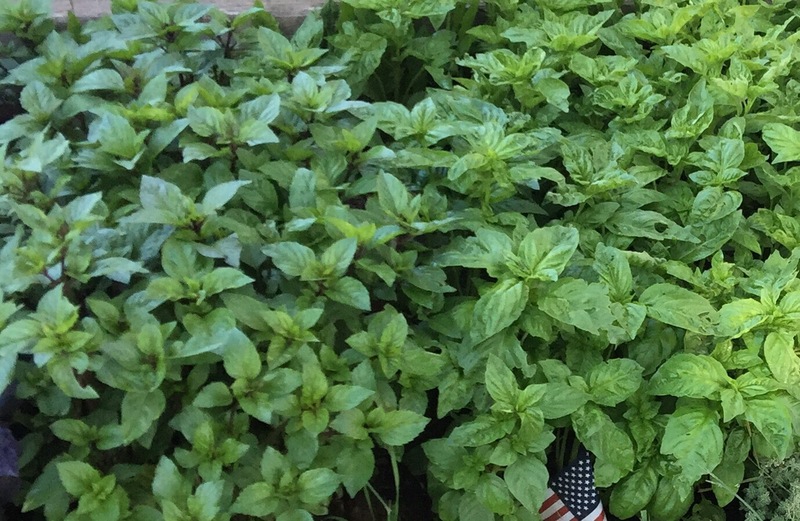 Who doesn’t love the smell of basil? My garden has 5 different kinds! Everyone notices the smell and involuntarily stops to appreciate it. 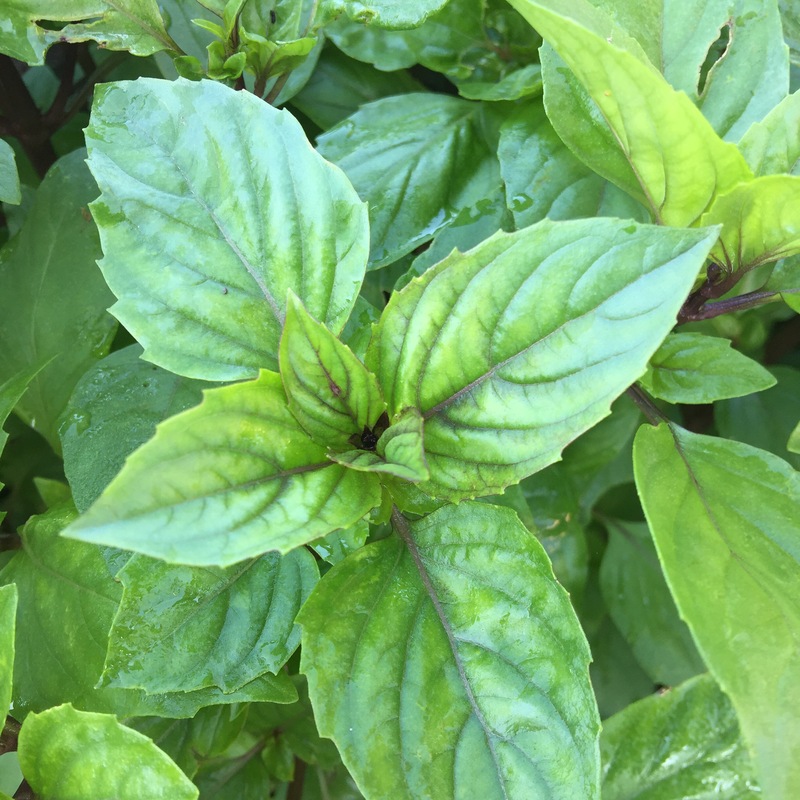 I have heard a lot of people talk about their attempts at basil, so this blog is for them. 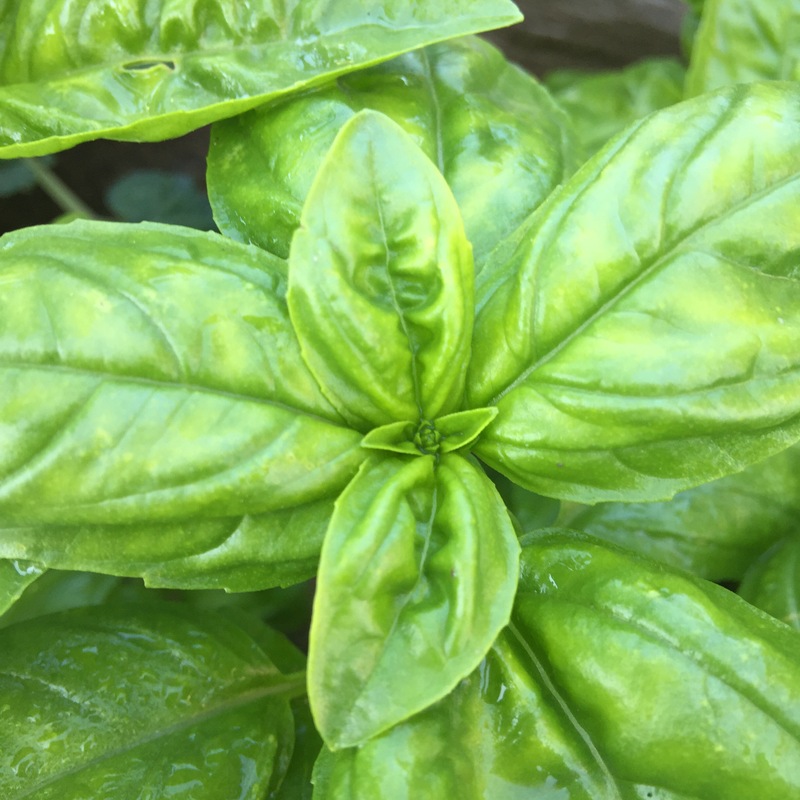 If you live around a wegmans, you have probably purchased a hydroponically grown bag of basil with the roots still attached in little blocks and tried to stick it in the ground or a pot. 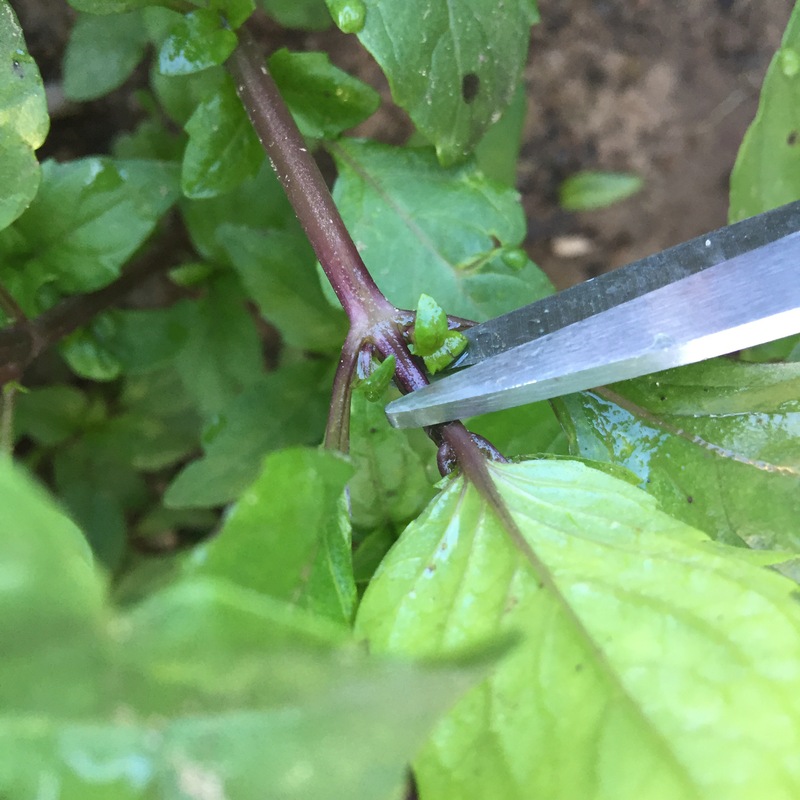 This seems to be about the most difficult way to grow basil and the way most likely to result in woody unusable stalks. This easy way – you will never want to pay for that stuff again. 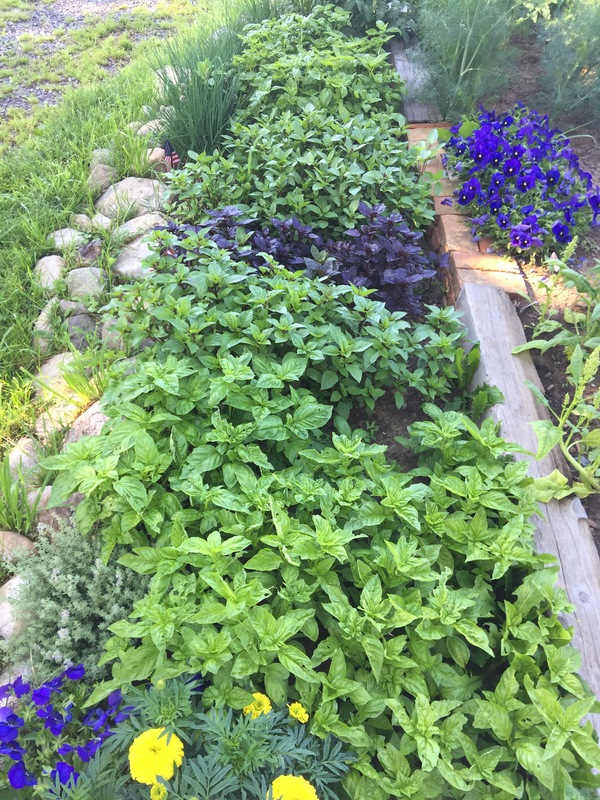 You need very little earth to grow a lot of basil. You can use a small patch of garden, or a wide pot on your porch. Either way you need – sun, heat and plenty of water. Choose the sunniest place you can and wait until it’s warm – tail end of spring. The soil should be at least 70, basil likes the summer warmth. Step 2: prepare a place to plant. This can be in the ground or in a pot, but choose the sunniest place possible. The soil should be anything but clay – if you have very compact soil just add somethings else to break it up – anything really – compost, potting soil, anything that the tiny roots can grab on to and stir it up. Here’s the thing – we buy them in the stores as 8 or 10 inch stalks. That’s not the way to get the most out of them. 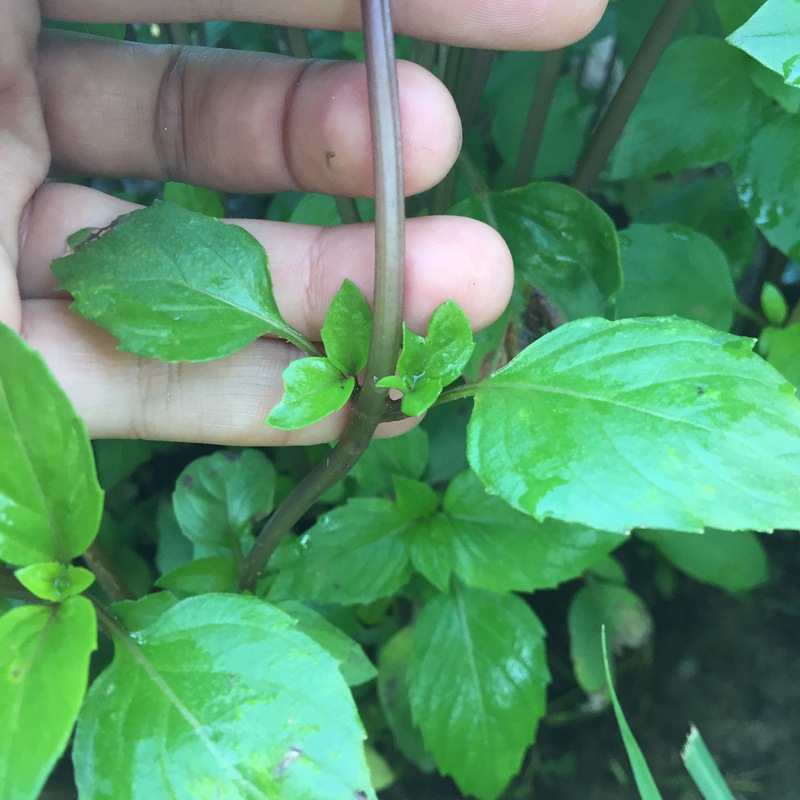 You can prune a basil and take its leaves over and over again. The simple trick is that you cannot let this plant go to flower. Once you see this pinch it off. This will stimulate the adjacent leafs to grow and keep the plant generally more tender. Once a basil starts to flower, it’s cute, but there’s no more point. The plant’s energy goes into making seeds. Each time you pinch off the center stalk, the two below it will take over. They will grow large leaves you can pluck and each will also attempt a flower that you’ll have to prune off. In effect, if you prune the basil’s first attempt at flowering it’s leaf production will almost double. 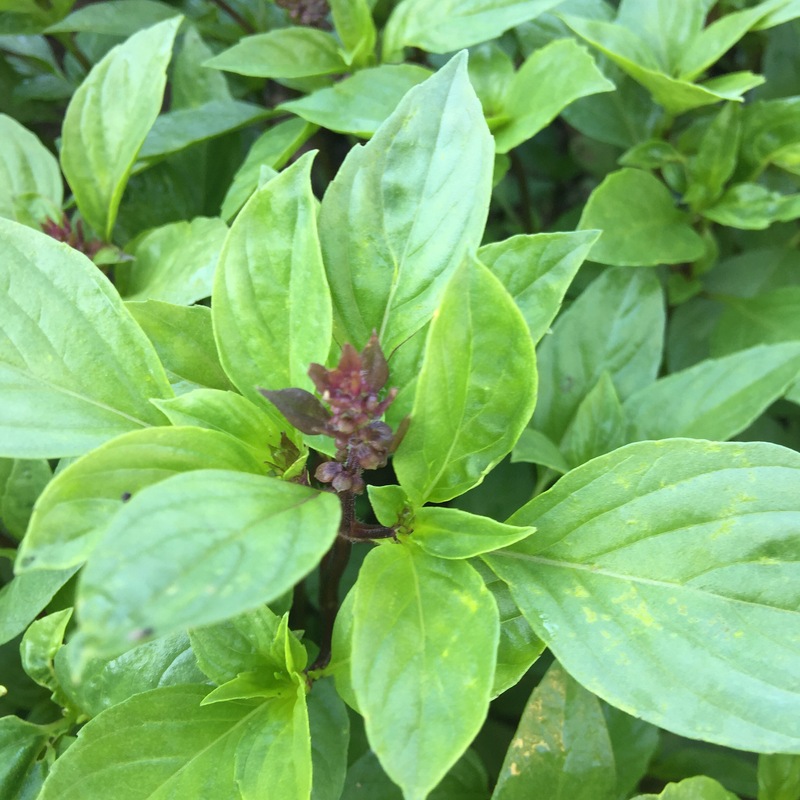 Once your basil is growing – to a height of 8 inches or so – each week pinch off its potential flowers, then go back through and cut off its largest leaves. If you do this – the same seed packet will keep you busy all summer. You can always add more seeds to the same space at any time if you’d like to grow more. So to totally break it down – wait until it’s warm, sprinkle seeds on some dirt, put them in the sun, water them every day, prune them when they’re big. Chances are you’ll have more than you can use at the time they need pruning. I like to wash and then freeze or dry it. To freeze it, put a handful in a ziplock bag and flatten it out. 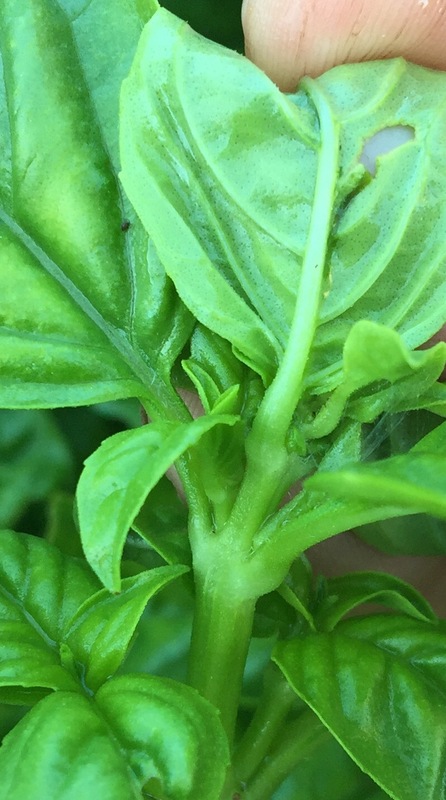 When you are wishing for fresh basil for your pasta or Pad Thai in the middle of winter, just break a chunk off. 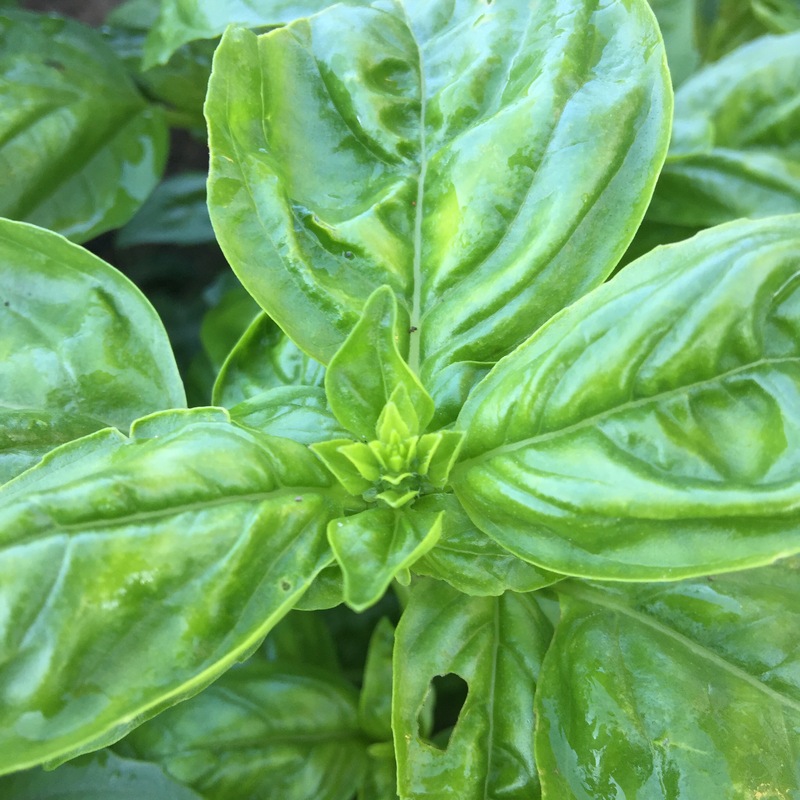 This retains a much stronger flavor than dried basil. To dry it, lay it out on a cookie sheet and put it in a 200 degree over for 15-20 minutes (set a timer – its easy to forget it’s there). In a food processor pulse to chop basil, add Parmesan and garlic, pulse to incorporate. Add olive oil until you like the consistency. Add pine nuts and pulse to chop – don’t over process or you’ll lose the texture of the nuts. Add more oil if necessary and taste it before you add seasoning. Parmesan is very salty, you may not need to add more. 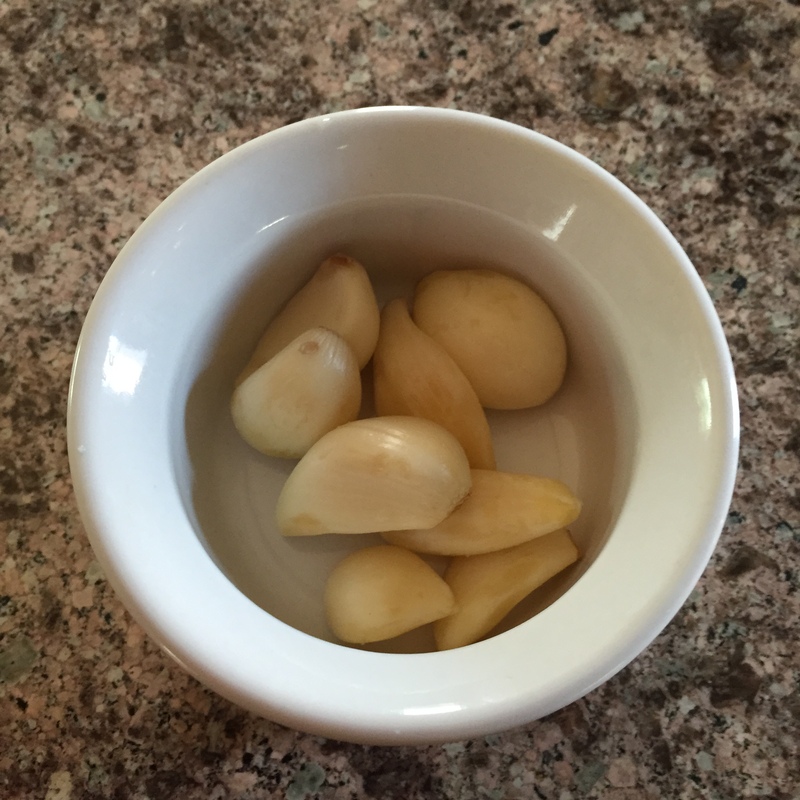 Stir in salt & pepper with a spoon to avoid turning the nuts into paste. I keep this in the freezer for up to a year if I don’t need it all at once. 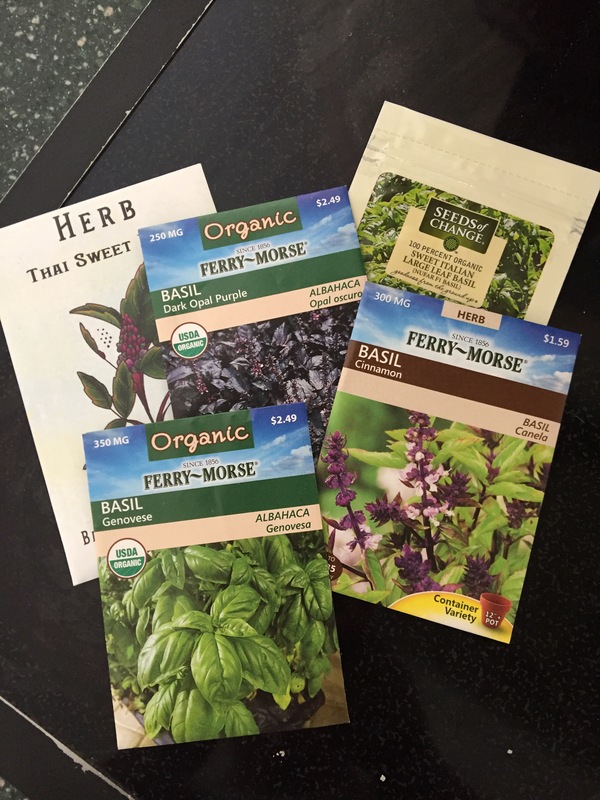 Stay tuned for different pesto recipes for your other herbs! 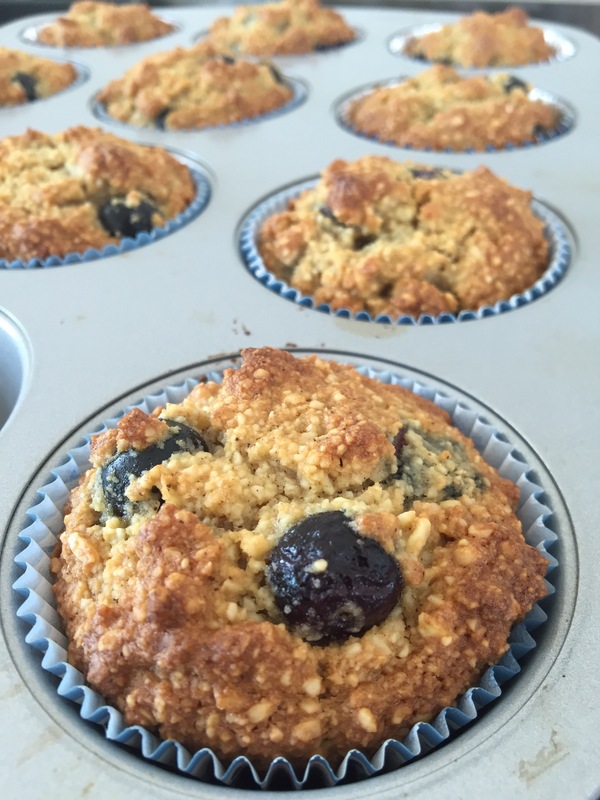 If you’ve read anything else on this blog you know that I am not a gluten free sort of person. I do however, live on a sort of low-burn keto diet. I originally took this recipie from Nancy Jenkins’ book Virgin Territory, which is a lovely story about the journey a few rogue olive trees took her on. I’ve swapped out the sugar to fit into a ketogenic diet but it also happens to be gluten free and yummy (also very easy). 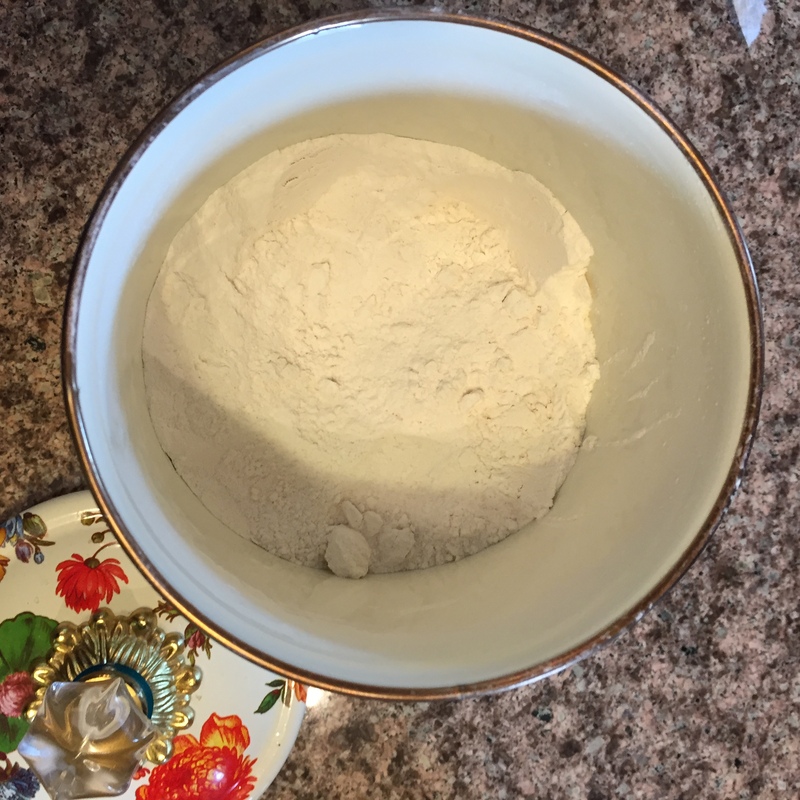 1/4 c xylitol – I measure it out and then grind it finer to make it dissolve more easily. 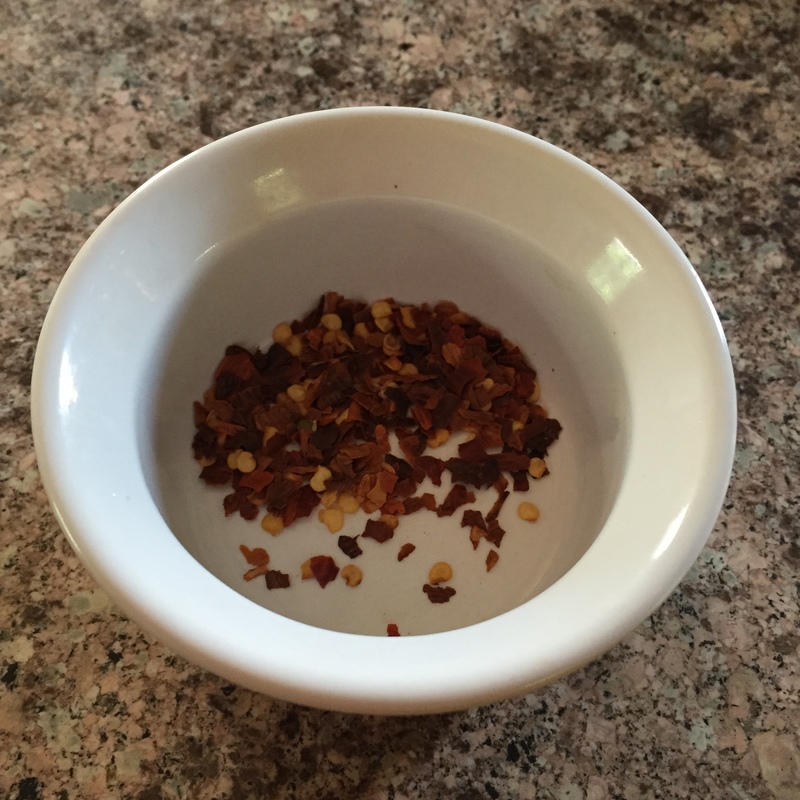 You can use a coffee grinder if you clean it out well or a mortar & pestle. Be sure to measure before you grind or you will change the volume. Mix the dry ingredients, mix wet ingredients, add wet ingredients to dry ingredients and fold in blueberries. This will not fill a standard 12 cup muffin tin, so don’t think you’ve missed something when you parse it out. it makes about 10. You can oil the tin or use cupcake foils. Bake for 5 minutes and then turn the oven down to 350 and bake for another 20 minutes (until they turn a nice golden brown). ♥♥♥ I love, love, love America’s Test Kitchen. Its not glamorous. There aren’t any sparkling kitchen sets, intense competitions or celebrity judges, and no one will curse at you if you’re refrigerator isn’t clean. I doubt as many people have heard of Christopher Kimball as have Bobby Flay. Christopher Kimball and company are absolutely my favorite culinary resource. America’s Test Kitchen produces cooking shows, cookbooks and magazines; and whats so wonderful about these sources is the trial and error included in the recipes. Especially if you’re even remotely like me (having enormous difficulty actually adhering to a recipe), these great folks can save you a lot of trouble. Part of their model is to choose items that are common and either commonly messed up, not as good as they could be or way to complicated for a normal person to have time for. Then, they experiment with different methods, ingredients and equipment. You get the results of each, what tasters liked best and what flopped. Take 5 minutes to read their kitchen diary entry before each recipe and save yourself a lot of trouble while learning methods and chemistry at the same time. My latest adventure with America’s Test Kitchen comes from the back of their Best of 2016 magazine – the Bee Sting Cake. The only things I changed was to use a spring form pan, and I added an extra couple of tablespoons of honey which created a delicious caramel affect around the edges of the cake that reminded me of the delicious burnt edges of a baklava. Usually I’m a purist about not using clever rearrangements of corn (this is another topic altogether). This time taking the time to read about the several attempts at variations of this cake stopped me from attempting the exclusion of corn starch. Consequently, the recipe contributed by Rebeccah Marsters (Cook’s Country) came out exactly as promised. If you’re a home cook / foodie, and you haven’t explored America’s Test Kitchen yet, I highly recommend it. One of the things I love about pasta is that you can make a pasta dish out of pretty much any other dish’s ingredients. This is a common set of Mediterranean ingredients that began as salad and turned into pizza, calzones, roasted chicken toppings and more. 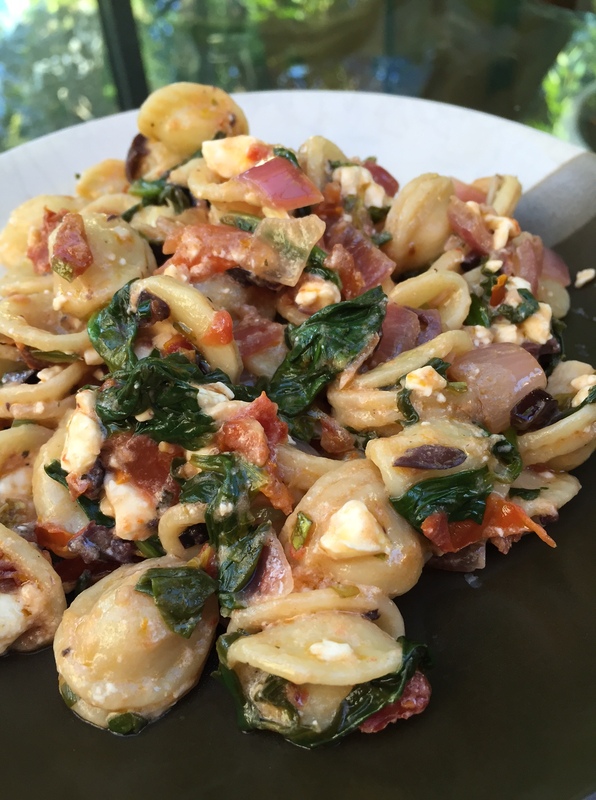 I like the orecchiette because their center depression is a great spot for the vegetables to get stuck, giving you flavor and texture in every bite. 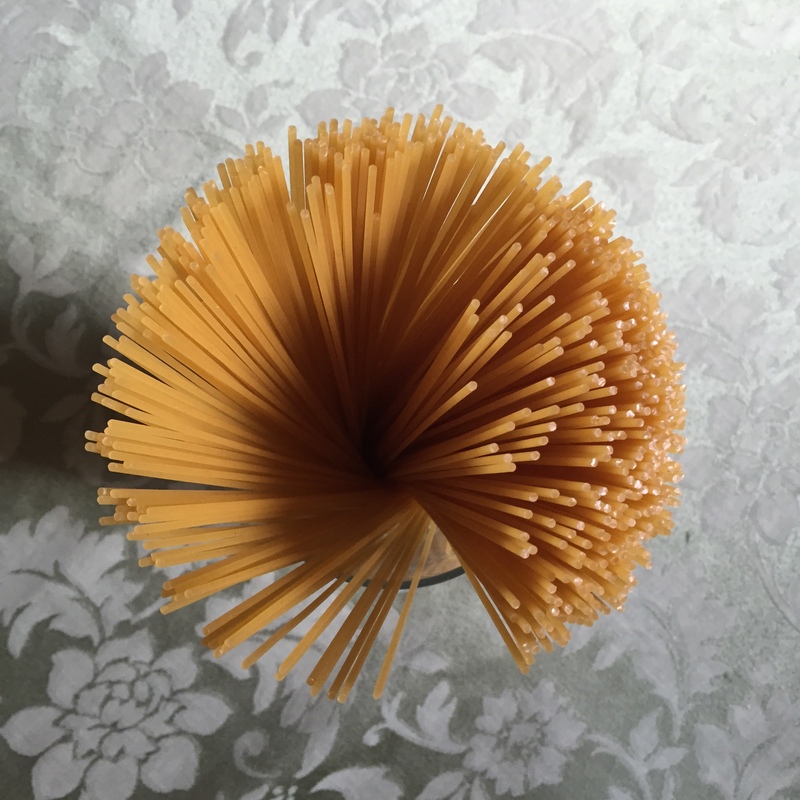 Put your water on to boil with a little olive oil in it to keep the noodles from sticking together. While its heating up, add 2 tbs. 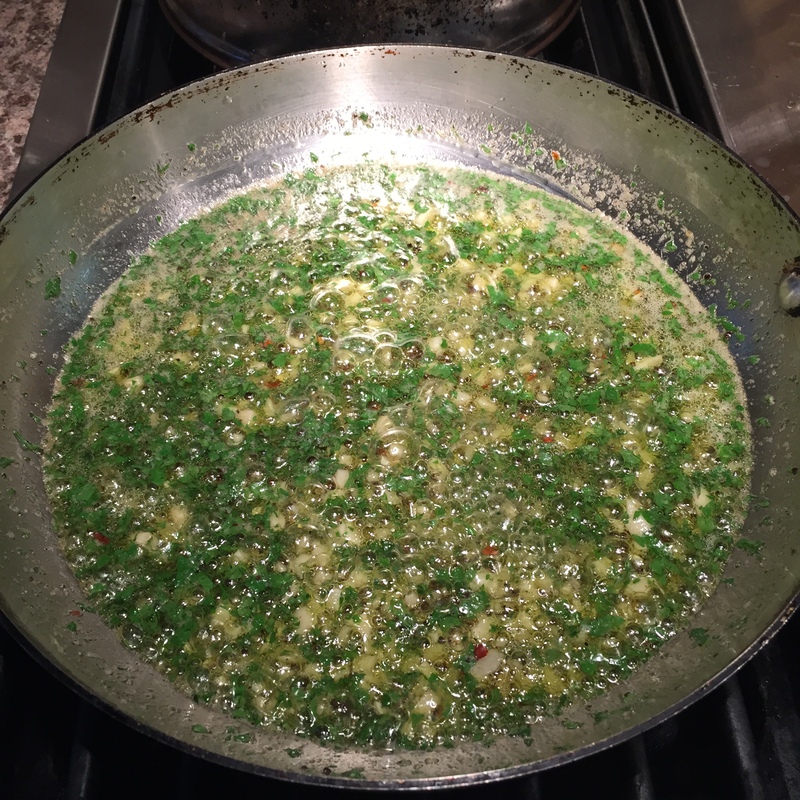 of olive oil to a large skillet. Even though you’re sauteing, resist the temptation to jack the heat up! You don’t want the oil to smoke, and its just not necessary to cook this. Start with medium heat and add the garlic, onion, sun dried tomatoes, salt & pepper, crushed red pepper. Careful with the crushed red – it will be more spicy because you’re putting it in the oil at the beginning than it is when you sprinkle it over something at the end. Once your onions are translucent, add the fresh tomato, stir a few times to help it start to break down and then add the spinach. Once the spinach is wilted, add the olives. Cook for just a couple of minutes until everything is hot. Then turn off the heat and toss in the feta. By now your pasta should be done and you can toss everything together. Now that nothing is exposed to heat, add another several tbs. of olive oil to coat or just drizzle it over your dish. This way you get to actually taste the flavor of the oil, and receive the health benefits that tend to get lost during cooking. Origination: just because it says product of Italy does not mean it’s a product of Italy. Don’t get me wrong, Italy is not the only culprit. But it’s the worst, and since embarking on this oily adventure, I have pretty much stopped buying “Italian” olive oil. This product origination deception is practiced on the public via large scale supermarket suppliers. There happen to be a lot of large processing facilities in Northern Italy relatively speaking – which is interesting since the country’s main olive producing region is in the South. These processing locations receive olives from various places – some from Italy, Spain, Greece, Tunisia, wherever they are grown and can be gotten cheaply. These olives are shipped to these locations where they are processed, bottled, labeled “product of Italy,” and sold in your local supermarket. Bertolli for example, is name that American’s recognize. According to Tom Mueller this company doesn’t even own an olive grove. And when you think about it, it makes sense. How many olive trees would Colavia need to have in order to provide gallon jugs of oil to every supermarket in the entire country? Right. The problem with this whole shipping business, besides the lie, can be found in the deodorization category. Deodorization: chemical processes are used to make oil from old rancid olives. The second the olive falls from the tree its decomposition process begins in order to nourish the seed within for germination. Bruising accelerates this process. Good olive oil is pressed within hours of that separation, and the fewer hours the better. Deodorization is a process that allows producers to still make oil out of olives that have been sitting around getting musty and gross before they are pressed. The old olives are pressed, and the oil is chemically deodorized to remove its offensive tastes and odors, and subsequently further refined to remove the chemicals. Thus relieving it of any health benefits, eliminating the chemical properties that make the olive oil fat healthy, and basically giving you some other man made creation that slightly resembles olive oil. Recently there has been a new initiative to protect local growers by labeling bottles with a seal that indicates that the olives are from the region they say they are. Wegmans has begun doing this. This is a step in the right direction, unfortunately, it does not mean that the oil has not been deodorized. Naming: There is no such thing as “light” or “virgin” olive oil. Even the label “pure olive oil” is deceitful. The only real olive oil is first cold pressed extra virgin. This is something else. It is either a.) a different less expensive seed oil with a little real olive oil added to it to make it smell right and look a little darker, or b.) worse, not a little real olive oil added, but a little chlorophyll added to make it green, or c.) extracted after the first press to get every last drop out of the already smashed olive and its leftover seeds. This process requires refinement to extract the oil, and then separate it from the water and chemicals needed to extract it. Might as well save your money and buy canola oil, these oils are not what you are looking for in olive oil – a monounsaturated fat. Adulteration: real olive oil is frequently cut with cheaper seed oils. According to a UC Davis study, “Of the five top-selling imported “extra virgin” olive oil brings in the United States, 73 percent of the samples failed the IOC sensory standards for extra virgin olive oils”(IOC is the International Olive Council). In order to make more money and take advantage of European agricultural subsidies, large oil companies apparently quite frequently add cheaper oils to real olive oil to stretch them and save money. Again, you are not getting what you think you’re paying for. If you look past the fact that this is a California University and of course they will hope that their findings lead you to purchase California olive oil, there is a lot of basic information in this study that helpful in determining what to look for and how to buy without doing your own extensive study. According to this same study, the top five worst offenders for your information are Star, Bertolli, Colavita, Filippo Berio, and Pompeian. 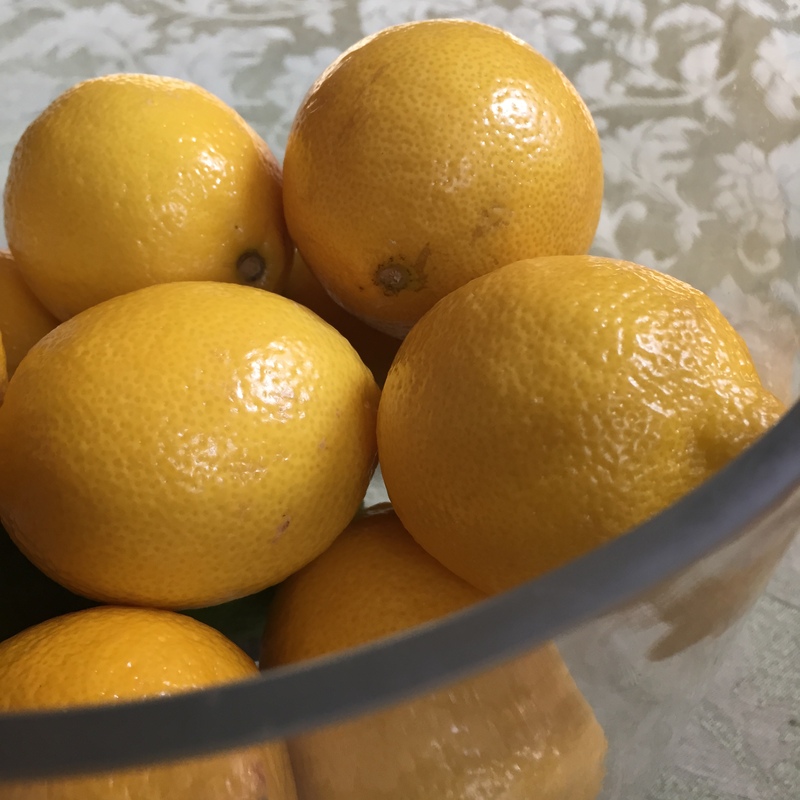 At first I found all of this information to be incredibly discouraging, and even infuriating, when I think of the years I’ve spent consuming crap and serving it to my family and friends. This is also horrible for small farmers who produce real olive oil. If you read into this for yourself, you’ll see how they get pushed around by their various governments and bigger companies who have incredibly incestuous relationships with those governments. The FDA is aware of all of this by the way, they just have bigger fish to fry. Its difficult to know what to buy because there are no easy answers and the bottles almost never give the information that you’re looking for. I came to the conclusion that each oil I wished to try, needed to be investigated individually. But don’t worry! 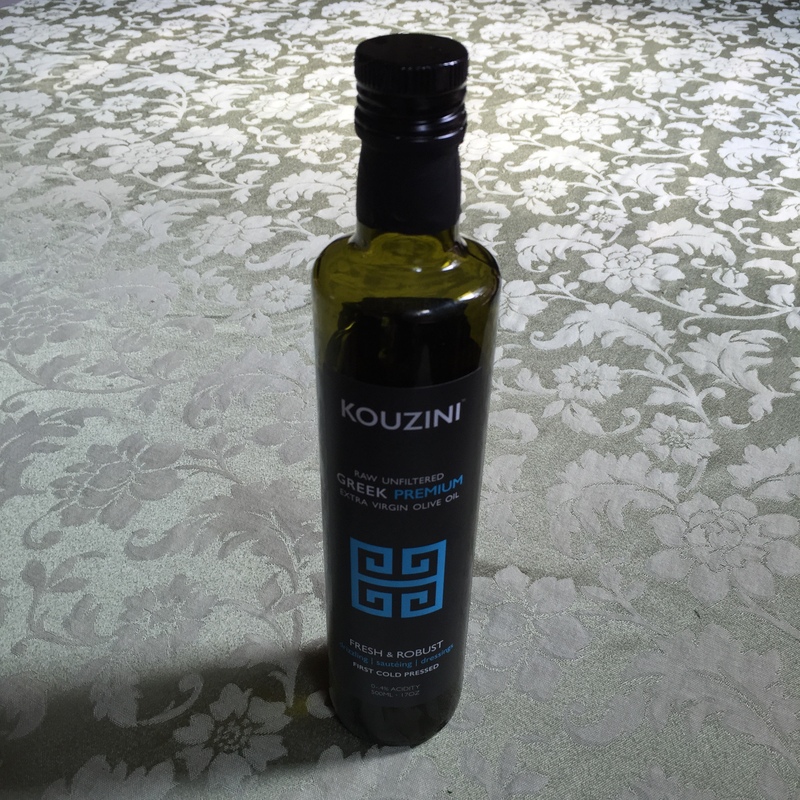 Once you start investigating the world of really good olive oil, it becomes very interesting. Next time, good olive oil! 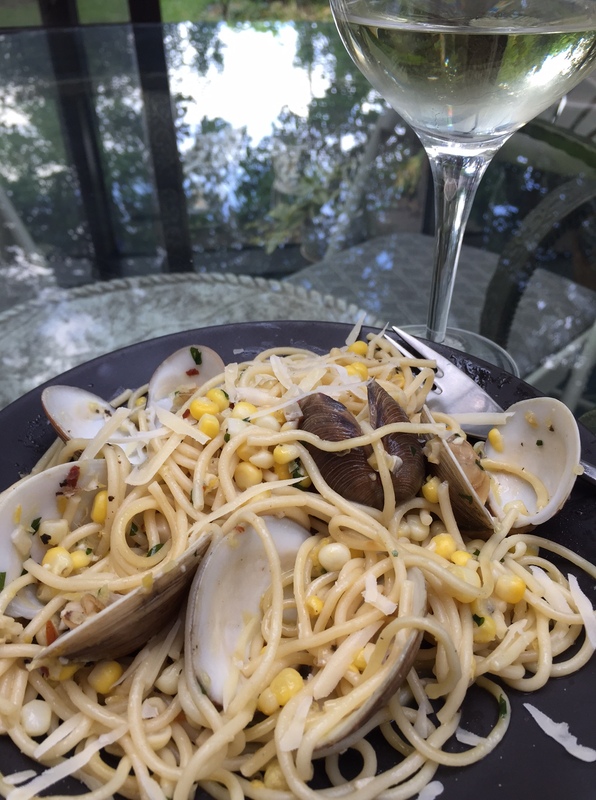 Keeping in mind that I’m still a relative amateur, I’ll share with you what I’ve learned about the supply here in Rochester, and what to look for when you buy, and the most common question I’ve gotten – what about Wegmans organic extra virgin olive oil? Disclaimer – I am not an IOC member, nor chemist, nor professional taster, nor grower. I’m a cook that likes to experiment and research. I have tried to reduce everything I’ve read to a few paragraphs and this is by no means a complete representation of the information available. If you see any incomplete information or inaccuracies that can be refuted with research please do leave a comment. We are after the truth around here. I loooooooove artichokes. 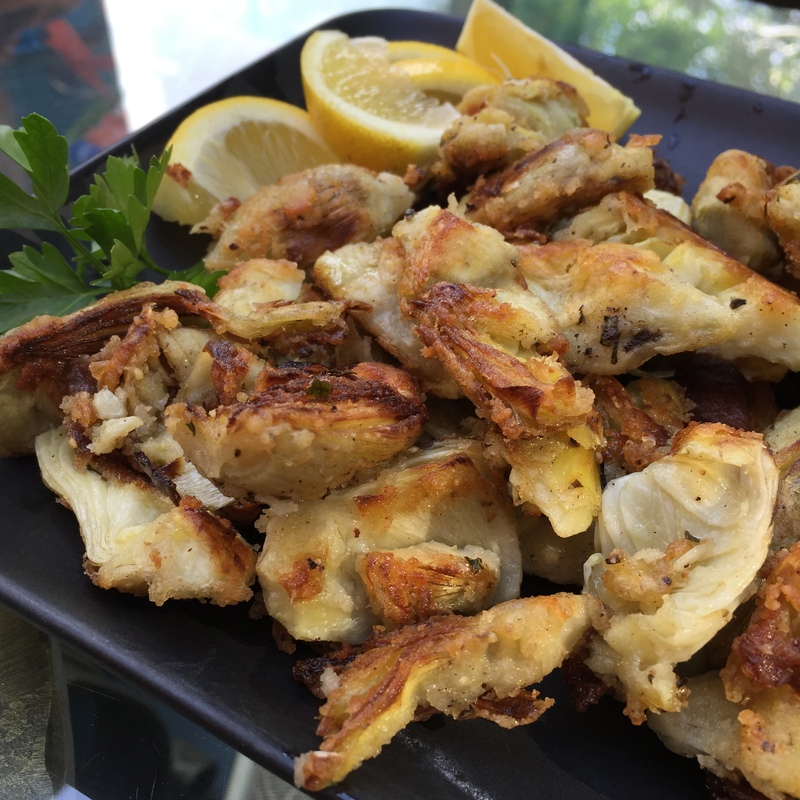 Growing up, my Italian family members made them for most family gatherings – steamed and stuffed with garlic, seasonings, breadcrumbs and Parmesan. I have a kind of mushed memory where every occasion looks the same as we sat around the table pulling them apart, scraping the flesh and stuffing off of the leaves with out teeth whilst making fun of each other. Years ago a lovely Roman waiter delivered an artichoke to my table that I didn’t order. No no no, he said – I know you didn’t order it, but is so good, you just have to try it, no charge, from the chef. This small experience was apparently a watershed moment in the way that I viewed food, because 10 years later I still remember exactly how everything around me looked, and the exquisitely delicious simplicity of the most fantastic artichoke I have ever tasted to this day. 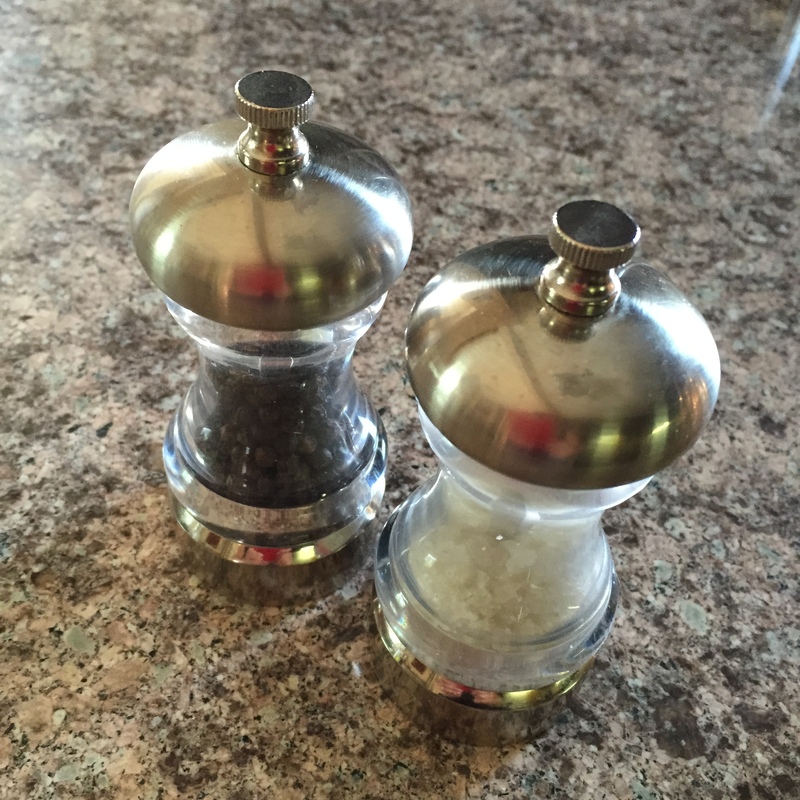 Thank you chef and waiter – since then I’ve become borderline obsessed with finding other ways to cook them. Unfortunately here in the States we do not have the luxury of several varieties to choose from, but nevertheless, the possibilities remain extensive. 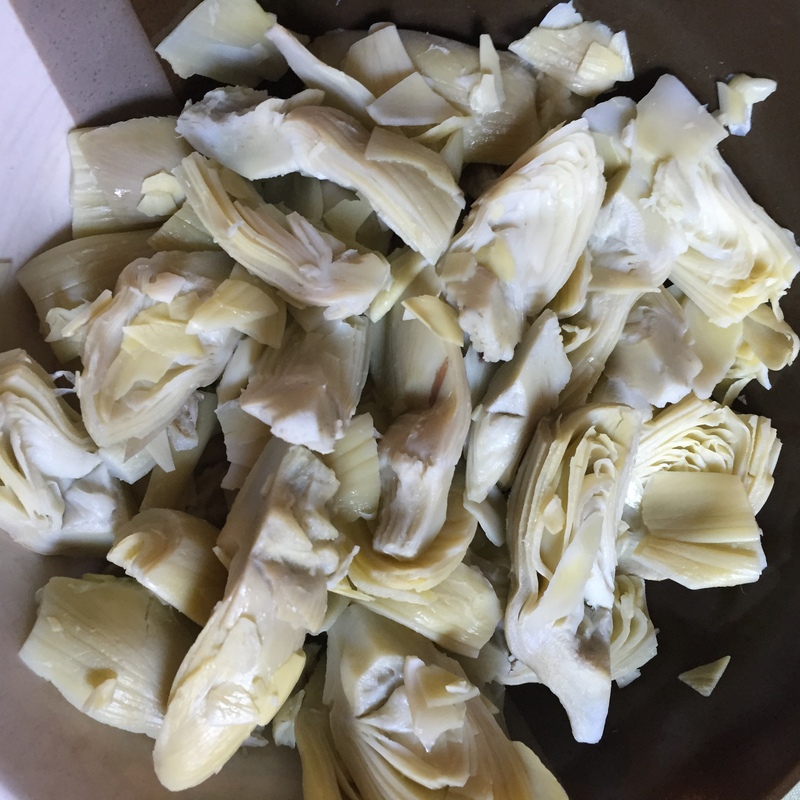 artichokes hearts – you can prepare them yourself fresh, or take the easy (and less expensive) cheater route of buying them frozen. Usually, I prefer fresh everything. But I like frozen artichokes because you can get them any time of year, and more importantly, they are not stored in brine, which I think ruins their flavor. The pictures here are frozen artichoke hearts from Wegmans. 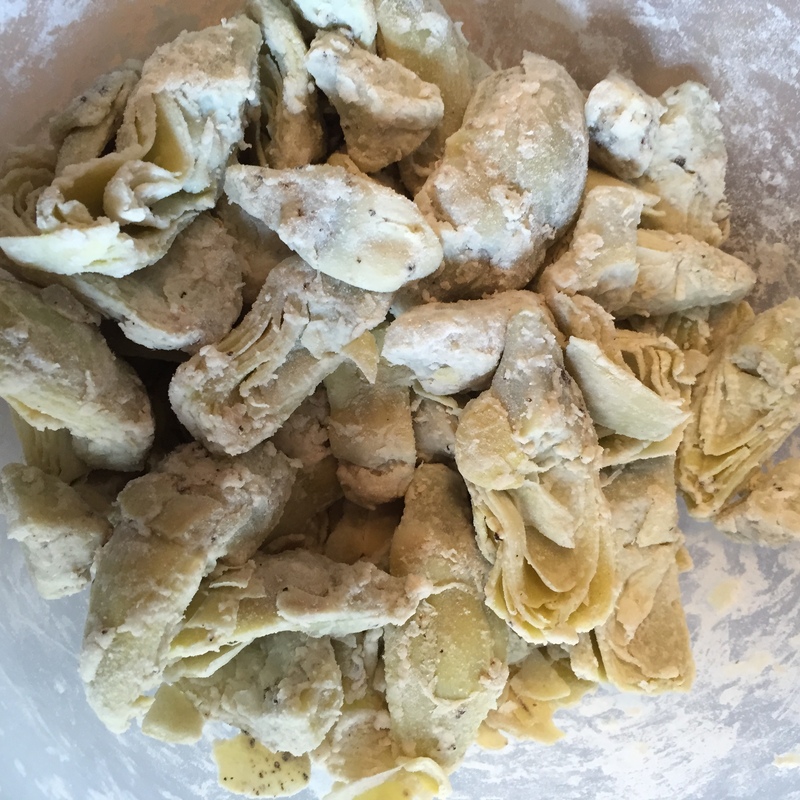 Toss your artichokes with some flour and salt & pepper. 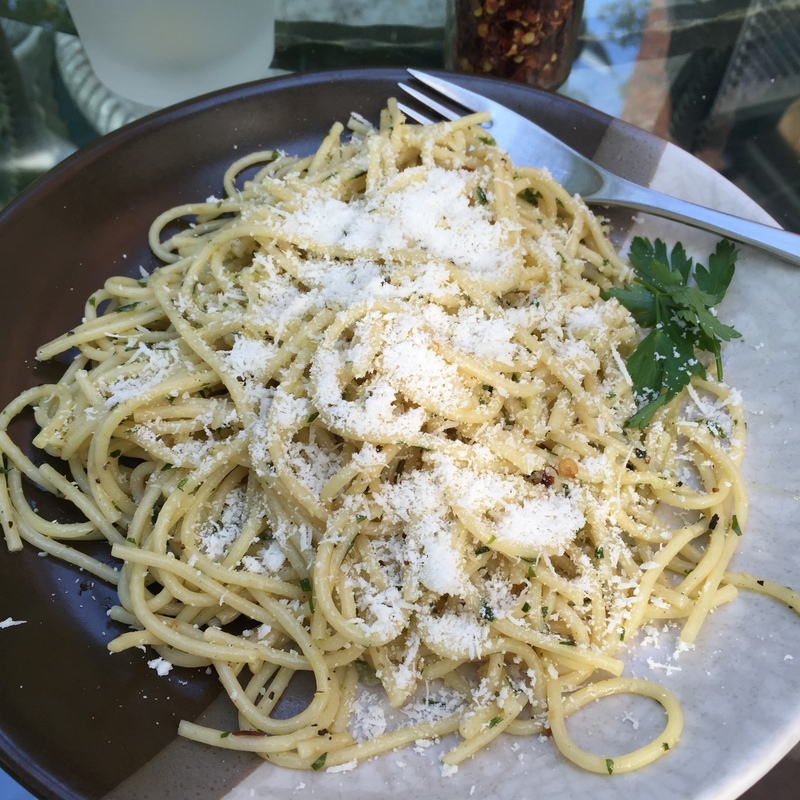 You can add anything else you like as well – pepper flakes, parsley, garlic, etc. Heat about a 1/4 inch of olive oil in a large skillet. Don’t turn it up to high, you don’t need the heat and you want to keep the oil from smoking. Add your artichokes and fry until golden on one side, then toss with a spatula and allow time for another side to brown. Serve immediately. Sprinkle them with salt and drizzle with lemon juice. Yum. Lately I’ve been studying all things olive oil. I was thinking of all the beautiful ingredients involved in Italian cuisine, and had the random thought that I didn’t just want to make tasty Mediterranean food, but I wanted to really know it. I thought of how delicious the simplest food is when its done really really well. There is nothing like the combination of a crusty bread, fresh mozzarella (and I do not mean the mass produced kind you buy at Wegmans), basil and tomatoes with a little olive oil drizzled on top. Its different when the tomatoes are grown on the slope of a volcano. In the town of Tropea, I had an onion that was so amazingly delicious that I sat happily dipping it in the oil & vinegar on my plate munching on the slices as if they were something else like carrots or red pepper spears. Its amazing to me that food is bred to make it look a certain way on the supermarket shelf, rather than taste the most flavorful way. I want to get back to the way things taste, at their most fundamental level. Olive oil seems the best place to start – and if not, at least its the most romantic place to start. I’ll go into more detail on my olive oil education later. Tonight I want to share a quick recipe, or rather, a basis for whatever recipe you want it to become. In Italy, when its late, and you’re tired and you have nothing in the house, this (or some variation of this) is what you throw together. Basically its infused olive oil – so simple, yet surprisingly satisfying. some people add anchovies. not me, but feel free. Put your water on to boil first, this doesn’t take very long. Heat the oil in a skillet, and keep the heat on the low – medium side. You want to avoid bringing the oil temperature too high – you’ll lose the flavor and the health benefits if it starts to smoke. Toss your spices in the oil and let them simmer in the oil for a few minutes. 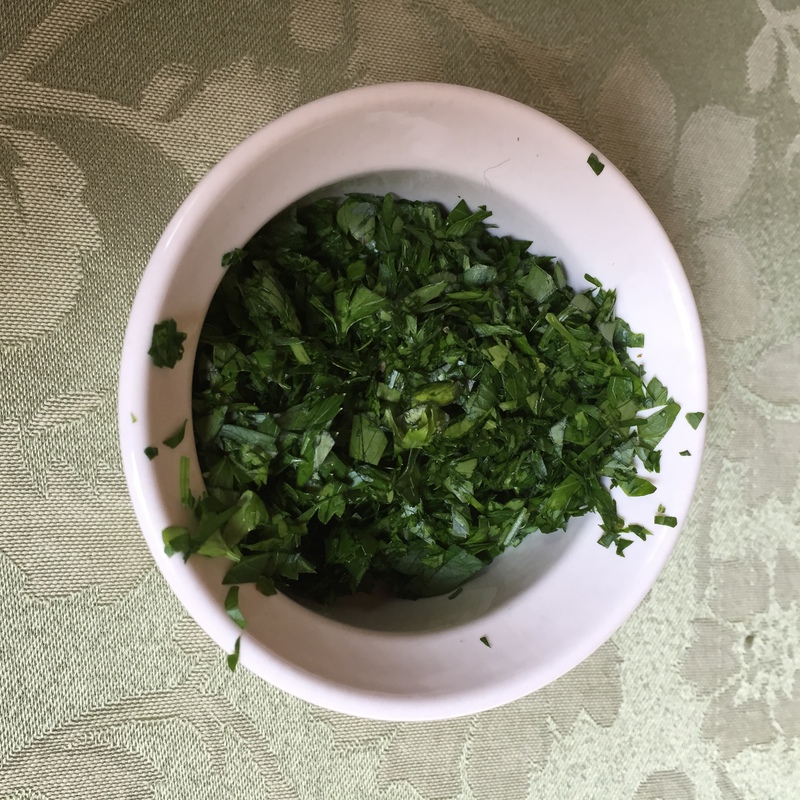 When the parsley starts to turn from bright to dark green, and you can smell everything in the air its done. Toss it all with your spaghetti and sprinkle with some nice salty Parmesan or Romano. Its like the adult version of the butter and cheese noodles that picky kids demand. Enjoy.